FOOD! You’re most likely to win food in the McDonald’s Minion Mania game. It’s just as with the McDonald’s Monopoly game. But there are 5 other prizes which you do have a respectable shot of winning. I’ll get to those in a second. It’s a Fandango movie promo code valid for one showing of Minions (up to $13). Must be redeemed by 9/30/15. It’s a special 3 mini-movie collection starring characters from Despicable Me 2 and Minions. It’s a digital download worth $4.99. This free movie download may be just what your family wants. The movie is 2-years-old by now but animated movies hold up well, don’t you think? This prize is worth $2.99. This is a killer prize! Imagine getting $50 worth of food off the dollar menu. That’s a lot of free food. If this isn’t enough reason to take your kids to McDonald’s – I don’t know what is. 26 lucky winners will receive a 3-day, 2-night trip for 2 to attend a live-action NBC Sports Experience. This may even be for a playoff game. Date and time restrictions apply, of course. The prize holder gets to decide what sport they would like to attend. The winner will also receive a check for a discretionary $500. This prize is worth $4,200. Age restrictions apply. There are other prizes up for grabs for the lucky few. For instance, each week McDonald’s is giving away $250,000 to one lucky winner. This runs from July 7th to August 3rd. 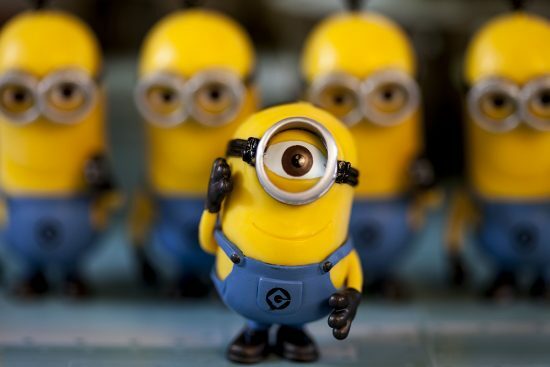 Yep – McDonald’s will be giving $1,000,000 as part of their Minion Mania contest. There are also several trips available to Universal Orlando Resort and Universal Studios Hollywood. There will be 14 winners for each of the prizes. They are 4-day, 3-night experiences. Did I mention you don’t necessarily have to spend a cent to enter this contest? To use a snazzy promo code and submit your name for free, click here. Note: If you haven’t read this post, What Everyone Should Know about the McDonald’s Minion Mania Instant Win Game, you definitely should before playing. Check out this post for tons more ways to win but it’s for TODAY ONLY! With age comes some perks. There are a large number of restaurants that want to attract older customers to their dining establishment, and one of the best ways to do this is to give a senior discount. The one key element is that these discounts will rarely be automatically given. You’ll need to ask for them, and in some cases, show proof of your age. It’s also important to note that restaurants may be independently owned, so the senior discounts listed below might vary from restaurant to restaurant. The best thing to do is to ask about any discounts available before being seated and served. Even if the restaurant you frequent is not listed in the below list, it’s still well worth your while to ask if they offer a senior discount. Even many small mom and pop owned restaurants offer discounted meas to seniors, although they will rarely advertise this. It never hurts to ask, and there is a decent chance that by doing so, you’ll get a portion off your dining bill. Discounts will usually range from 10% to 20% off of the dining bill. There are also other ways to save money at restaurants you can use to save even more. Senior is also a relative term in the eyes of each restaurant chain that ranges from 50 years of age to 65 years of age. It can also be worthwhile signing up with AARP once you reach the age of 50 since some restaurants give discounts to AARP members. Even if you don’t currently qualify for and of the discounts, you probably know someone who does who doesn’t realize that they could be getting these discounts when they frequent these restaurants. Part of taking advantage of these discounts is knowing that they exist in the first place. This is an ongoing list that we’d like to keep as updated as possible. If you are familiar with any other restaurants that offer senior discounts, we’d love to hear about them so we can add them to our list. Also, if a restaurant on this list has changed the ages or the discount offered, please let us know. Simply leave a comment in this thread and we’ll add it into the main article. One of my favorite restaurants in town isn’t the swanky chain restaurant, the fine dining establishment, or the fast food place. It’s the simple cafeteria. You know the drill: You push your tray down the line past the steam tables laden with everything from salad to dessert. Many people think that the cafeteria isn’t good, that it’s boring (no bar or ESPN on twenty screens), that it’s like a school cafeteria, or that it’s only for the older folks. Not true. I find that the cafeteria is a very frugal choice for a meal out and I make it a point to find a cafeteria when we travel. So what’s great about the cafeteria? For not much more than the price of a combo meal at a fast food joint, you can get a meat, two sides, and a drink. Dessert won’t set you back $8 like it will at a chain restaurant, either. If you aren’t that hungry, you can just get a couple of sides and a drink for under $5 at most cafeterias. Since there are usually no servers, there’s no need to tip which saves you even more. Though the price is cheap, the atmosphere is more like a sit-down restaurant and you can spend some quality time with your companions over your meal. While some people find the lack of a bar and TV screens to be a drawback, I find it’s a plus. When I go out, I want to focus on my food and my companions, not have everyone at the table staring slack-jawed at a football game or being yammered at by the talking heads on CNN. Most cafeterias are TV-free and it’s wonderful. The lack of a bar and loud music also means it tends to be quieter and lower key. The lack of servers means that you aren’t being interrupted every five minutes and you don’t feel rushed to turn over the table so the waiter can earn more tips. Most cafeterias have a wide variety of choices on the menu every day, and the options tend to rotate through the week. There’s usually chicken, beef, pasta, fish, and a large selection of vegetables and sides. This means that if one person is craving Italian and another wants fish, you can accommodate both wishes. Cafeterias are often good choices for picky kids, too, since there are usually at least a few things they will eat. Not only is the food good, it’s often as close to homemade as you can get. 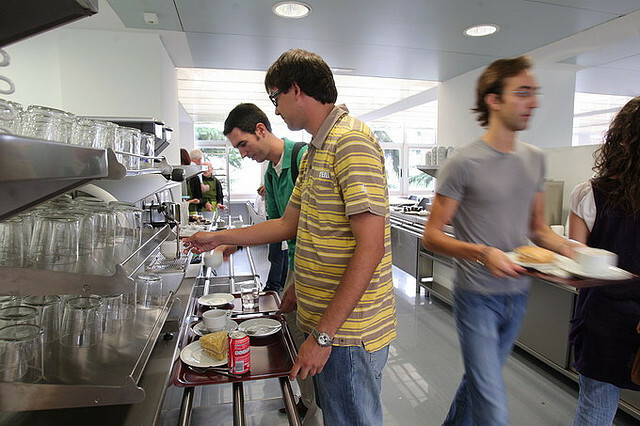 Many cafeterias make their own food on-site rather than having it shipped in, frozen, from some warehouse. While it may not be truly homemade, it’s often as close as you can get for a meal out and tastes better than chain food. Cafeterias aren’t just full of fried foods, mashed potatoes, and mac and cheese. There are salads, vegetables, grilled fish and chicken, and plain water to drink. These are not the cafeterias you remember from high school that served nothing but pizza (aka, “barf on a shingle” at my school), fries, mystery glop, and over-sauced pasta. While you can people watch anywhere, I find the patrons of the cafeteria to be especially fun. This is particularly true on Sundays when people turn up after church in their Sunday best. Around here, it’s a fashion show with people decked to the nines. 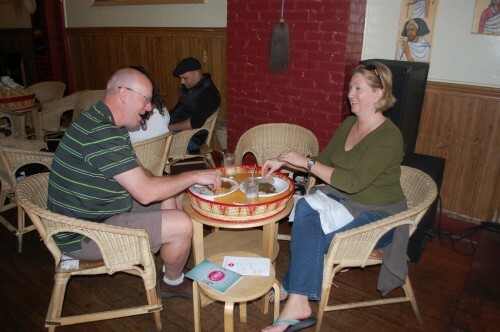 Cafeterias can also be great for budget holiday celebrations. Many offer Thanksgiving or Christmas promotions (such as full course meals) that can be eaten in or taken to go. This can be great if you don’t want to cook or physically can’t cook for whatever reason. If you’re alone at the holidays, it can be a great place to go and get out amongst other people without breaking the bank. It’s also a budget alternative for groups. Cafeterias aren’t what they used to be and they definitely don’t resemble the cafeterias you remember from school. They are budget-friendly places to go for a good meal out. If you have one near you, give your cafeteria a try. It may surprise you. Are Restaurant Coupon Deals Worth It? 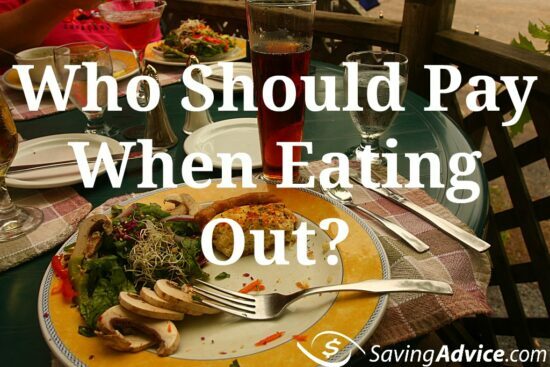 Eating out is often an indulgence, sometimes a necessity, and usually costly. It can also be a lot of fun. Where we choose to dine out is a personal decision but most of us can be helped in our decision making if we can find good food in a good venue that offers good value. For those of us on the lookout for bargains, restaurant coupons can push us to try new restaurants or influence us to return to the restaurants we know that we like. A great coupon can even help us to decide that it is time to try again a restaurant that we already have experienced and not enjoyed as much as we would have liked. Restaurant coupons come from a lot of sources. Local magazines usually include advertisements that an be clipped for discounts. Every week my mailbox is filled with fliers and mailers from a bunch of local restaurants who want to offer me five dollars off of a thirty dollar purchase or a free appetizer if I visit on a typically slow night. My newspaper sometimes has such coupons on plenty of restaurant websites do, too. I am sure that your experience is the same. For me, however, five dollars in savings is not enough to influence me. Whether I spend thirty-five or forty dollars is too marginal a savings for me to consider it. My experience with a restaurant will usually be far more important than a five dollar coupon or a free order of wings (which I would not eat, anyway, since I am a vegetarian). When savings are substantial, however, I am likely to more aggressively pursue them. Two new web services have emerged in the past few months which are giving me just such savings. Groupon and Half-off Depot offer deeply discounted gift certificates to restaurants and services in select cities throughout the USA and Canada. I suspect that there are similar web services in other countries but I have not had occasion to explore them. Today I will be enjoying dinner with my family at a local pizzeria using gift certificates that I recently purchased at Groupon. Groupon deals are offered for a limited time, typically one per day, and only accepts orders if a minimum number of members (you have to register as a user) agree to purchase the gift certificates. On the day that I recently visited Groupon, the deal of the day was for our favorite local pizza parlor. I was able to purchase three gift certificates with a twenty-five dollar face value for only ten dollars each. As a result, tonight’s dinner which I expect will cost fifty dollars based on menu prices will only cost me twenty dollars out of pocket — savings that easily justify eating at a restaurant that I know my family enjoys. Similarly, I recently enjoyed a day of paint ball with my son at a local paint ball facility. Normally a day pass (including equipment, CO2 and paint balls) costs a little more than forty dollars. With the passes that I purchased at Half Off Depot, I paid only thirty six dollars for both of us to play. Not surprisingly given the company’s name, I saved about fifty percent by shopping at Half Off Depot. What sources have you found for great, deeply discounted deals?